Cats are naturally curious, so they'll chase anything in their sight. Cats are natural predators; they're born to hunt. Your feline will probably chase anything that runs away, but the squirrel's bushy tail makes that particular rodent an enticing target. Tom may love chasing squirrels, but they can be hazardous to his health if he actually gets his paws on one. Odds are if you have squirrels in your backyard, Tom will want to chase them. His hunting instincts will quickly come into play. While eyeing his prey he'll silently nestle into the grass, press his ears back and stare motionless as he watches the clueless squirrel's every movement. Just when Tom feels confident he can make a pounce, he'll wiggle his rear end and dart forward at full strength. He'll chase the squirrel as far as he can, but once the squirrel dashes back into his burrow or up a tree and Tom realizes his hunt was a fail, he'll turn around and aim for his next victim. You're probably undoubtedly grossed out if you find a dead squirrel on your welcome mat. That's not your only concern. If Tom gets bit by a rabies-infected squirrel during a chase or if he eats a squirrel that is sick, he may catch the illness himself, although the incidence of rabies in the United States is rare, the Humane Society of the United States reports. Rabies affects the central nervous system. Watch for erratic abnormal behavior, such as snapping at inanimate objects or having problems walking, after Tom comes into contact with a squirrel. 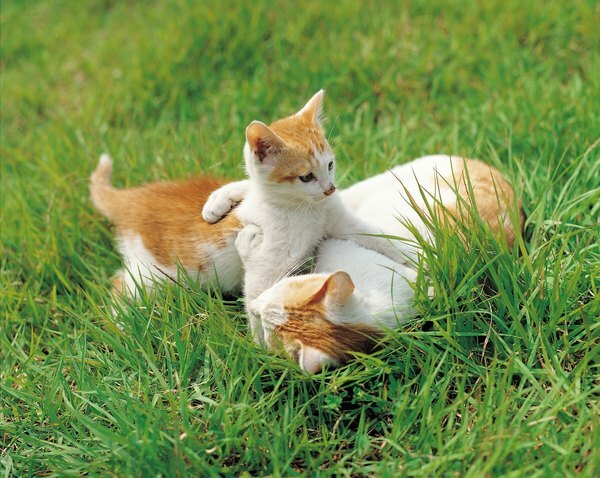 Keeping your feline family members up to date on all of their vaccinations can be life-saving and it prevent the incidence of rabies. Chasing squirrels keeps Tom entertained, but feasting on his prey causes a concern for choking. If your mischievous buddy winds up gagging, drooling or pawing at his face, or has a shortness of breath, he may have a piece of bone lodged in his throat. Open his mouth and visually look for the obstruction. Do not blindly reach down his throat unless you can see the bone fragment -- you may wind up pushing it down farther or causing other problems. Get him to the vet immediately if he shows any signs of choking. Even though you might not mind squirrels in your yard, your neighbor might not enjoy the fluffy rodents and set out traps to catch them. Various types of traps and poisons can be life-threatening to your precious kitty if he winds up chasing a squirrel into the bait. Even if your feline doesn't directly ingest rodent poison, if a dead squirrel has poison in his system, Tom can be poisoned when he snacks on the carcass. Keeping your cat indoors is the only way to fully safeguard against such hazards. Why Do Declawed Cats Bite Their Back Nails? Is It Okay for a Puppy to Play Chase?